Celebration III - Big News From Lucas Himself! The long rumored Star Wars for TV has been officially confirmed by the creator himself, George Lucas. At one of GL's guest appearances today, he confirmed not only the creation of one Star Wars TV show, but TWO! The first is a 3D Animated feature following in the same line as the Clone Wars Mini's seen on Cartoon Network. The second TV show will be a live action show about the adventures of a lot of the secondary or lesser characters that populate Star Wars. Big news indeed, stay tuned as more is made available! We have started our Picture Gallery for April 22nd, Day 2 of Celebration III. First off we have added some new items from Hasbro. They unvieled some new figures today from the Jedi vs Sith Multi Pack, some new Clone Troopers, as well as some new Sith figures. To check out the figures click on the image below to find our April 22nd Picture Gallery. We will have that Gallery finished early tomorrow in anticipation of coverage of the George Lucas Visit! There is no escaping it, it is inevitable, it is your destiny. If you are at Celebration 3, you will stand in a line! There is no way around it. 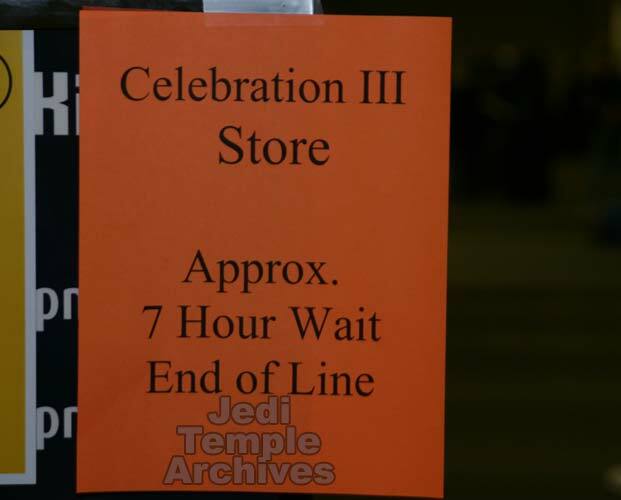 However, the Celebration 3 Store has to be one of, if not the worst line yet. Clocking in at over 7 hours of waiting, this is the Mother of all Lines. However, many may gripe about the wait, but just realize that when 30,000+ people converge on one spot, all with pretty much the same thing in mind (must buy LFL Licensed Merchandise), you are going to have lines. There is no amount of planning that will make it better. So be patient, and stay focused! Our Picture Gallery for April 21st is done, and it weighs in with over 130 images. However, what good are images without at least a little info. Hasbro held their Q&A Seminar today, and quite a bit of info has come out of it. Some things of interest are the availability of the C3 Darth Vader, HasbroToyShop.com, and the Evolution sets. To check out the info click HERE! We are continuing to add picture after picture to our April 21st Picture Gallery. We have added Gentle Giant, Hasbro, and Master Replicas, and there is still more to add! As we update those Pics, Images for today (April 22nd) are starting to pour in. Make sure to check out our coverage as we are adding new material every hour! We are starting to add images to our Celebration 3 Coverage. Make sure to refresh and check back often as we will be adding more and more as the night goes on. Click on the picture below to check it out! Sorry for the lack of updates for the last few days, but we have been very busy preparing for our coverage of Celebration 3. Our Press Passes arrived, and we are on our way! Make sure to stop by this weekend as we bring you all we possibly can about this huge event. We did want to share a pic of the neat press passes we recieved! In ROTJ of Yoda warned Luke of the powers of the Emperor, and we saw some of that power when The Emperor tried to make Luke a crispy critter. However, who would of thought there was something else lethal hiding under those Robes. We find out in Episode 3 that Darth Sidious/Chancellor Palpatine/The Emperor has something else up his sleeve, and it is a lightsaber. Master Replicas through Best Buy Stores has released an Exclusive Dark Chromed version of it's Darth Sidious .45 Scaled Replica Lightsaber. While we don't have a Visual Guide for Master Replicas (YET! ), I just couldn't let this one slip away without showing it off. When I first saw it I thought it was almost serpent like, with it's smooth curves and sleek shape, very fitting of a Sith Lord. It is also a lot smaller than the other standard sabers we have seen. Remember this is the Dark Chrome Version, the version with the true colors comes out in June! Click on the image below to check it out! Brianstoys.com invites you to join them at Celebration III, where they will be near the entrance, at booth #211. They are bringing most of their inventory, so they will have quite a selection to choose from. Carrying everything from vintage to ROTS collectibles, this will be a great chance to see what they have to offer up close and personal! You can read their entire newsletter by Clicking here. The last two bounty hunter bust-ups enter the Gentle Giant Visual Guide: Dengar, and last but not least, Jango Fett. With such a well rounded group of bounty hunters offered as bust-ups, one can only wonder...what happened to IG-88? Two more bounty hunters enter the Gentle Giant Visual Guide. 4-LOM and Zuckuss, the mysterious pair forever to be confused with each other by vintage collectors, are a very cool edition to the Bust-Up line. You can find the entire set of bounty hunters at Alliance Collectibles! The Bounty Hunters Bust-ups continue with 2 more 'scum' to add to the Gentle Giant Visual Guide. The non-chase version of Boba Fett, and his bounty hunting rival, Bossk are todays additions. The Gentle Giant Visual Guide has a new Bounty Hunter in town...the Boba Fett chase version form the 3rd wave of Bust-Ups!! He's just 1 of 7 in the series, so keep checking back for more updates! Pick up a full case of 12 wave 3 Bust-Ups at Alliance Collectibles today! The day is set...on Saturday, April 23, George Lucas will be hangin out with all of us in Indianapolis! He will be there to answer your questions during 3 half hour time slots in the Sagamore Ballroom starting at 8:45am! There is more information about the show and how to get in at the Official Site...be sure to head over and read it all so you don't miss out on this once in a lifetime event! So, you don't have enough images of the Star Wars Saga in your collection yet, and you want something a bit special to get for yourself? Official Site has news on the 700+ page Creating the Worlds of Star Wars: 365 Days by Harry N. Abrams where John Knoll takes you through the Star Wars universe in full color and "KnollVision"...Head over and read the entire article now. All right...time to round out the Titanium Series in one big swoop! Filling out the first two waves are the Falcon, Slave I, an X-Wing, Y-Wing and Republic Gunship!! All come with stands and all have their own set of moving parts and are highly detailed! Check out the Titanium Section of the ROTS Guide for a closer look! And check out Alliance Collectibles to pick up what you missed out on! The M-Pire Comes to the Star Wars Shop! The evil M-Pire has invaded the StarWarsShop.com and we advise all citizens to eat as much chocolate as possible...or, at least but as much of the cool M-Pire stuff as you can...or both! Head on over to the StarWarsShop.com to check out all the M-Pire gear! 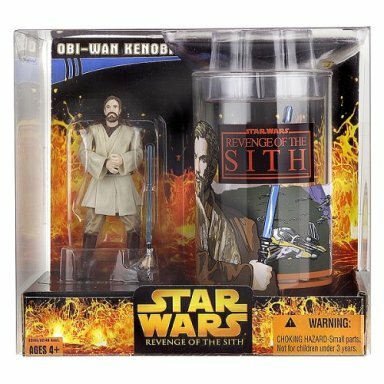 KB Toys.com is having a buy 3 figures get 1 free sale on a whol eslew of Revenge of the Sith stuff...Click here to check it out and hurry...the deal ends April 25! Moviephone.com will be doing weekly updates to their Star Wars section...check in every now and then to see what's going down in the Star Wars universe during these last 36 days leading up to Revenge of the Sith! The Titanium updates continue with the addition of the Snowspeeder in the Titanium Section of the ROTS Guide! With an opening cockpit, working air brakes and rotating guns, this baby is ready to take on the Imperial Walkers! Alliance Collectibles has all this and more, so head on over and check them out today! Another Original Trilogy vehicle has been added to the Titanium Section of the ROTS Guide! The Imperial TIE Fighter comes with a stand and a cockpit door that opens to reveal a little pilot! Head on over to Alliance Collectibles to build your Imperial Fleet! The Rebel A-Wing has been added to the Titanium Section of the ROTS Guide! Featuring an opening canpoy and retractible landing gear, this is a must addition to the OT collection!! This is the first of 2 Jedi Starfighters that we will see in the Titanium Series. This version comes with its own stand, andmoveable landing gear and cockpit! Check it out below or in the Titanium Section of the ROTS Guide! Don't forget...Alliance Collectibles has all your Titanium needs! One of my favorite ships of all time...heck, it started the whole Saga when the Star Destroyer flew...and flew...and flew over our heads in 1977...at the scale of the Titanium Series we finally get another version of this awesome ship! It comes with a stand and even a very tiny Tantive IV in it's belly! Check it out in Titanium Section of the ROTS Guide! Don't forget to head over to Alliance Collectibles to add the Star Destoryer to your collection! Our favorite astromech droid finally makes it to the Revenge of the Sith Visual Guide !! This version of R2-D2 is all dirtied up and he comes with a unique stand, pinchers that attach to his head and move when you press down on the center leg and a pair of rocket boosters! Alliance Collectibles has R2 and plenty other ROTS stuff in stock now, so head on over and fill up that shopping cart! Brianstoys.com latest newsletter is full of good stuff including a bunch of the great Master Replicas props, Revenge of the Sith figures galore, Battle Buddies and even Darth Tater! Next to be added to the Titanium Section of the Revenge of the Sith Visual Guide is the AT-RT...the one Titanium Series vehicle without moving parts, but how cool is it to have the grandfather of the AT-ST in the collection! Check it out below! 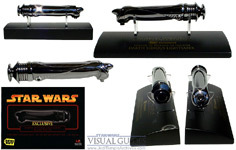 Alliance Collectibles carries this exclusive, so head on over and pick up a wave of this cool new line of vehicles! Oh come on, you knew that Hasbro would not leave the likes of the Clone Trooper, Chewbacca and Mace Windu off the Force Battler line! Check them out over at Hasbro's website!! The Titamium Series vehicles are very nicely detail die-cast ships and nearly all of them have moving parts! The Droid Tri-Fighter is a fine looking ship whose cockpit rotates a full 360 degrees! Check it out in the Titanium Section of the Revenge of the Sith Visual Guide. Big bad Count Dooku has found his way to the Revenge of the Sith Visual Guide. So you want to know what the figure is like..you'll have to brave some spoilers!! Speaking of which...head on over to Alliance Collectibles and spoil yourself with a few more ROTS figures! Don't forget that this week is the week when you can pick up a free Holographic Yoda with the purchase of $25 of Star Warsstuff! And, for you LEGO fanatics out there, a $14.99 LEGO purchase will earn you a free LEGO Mini TIE Interceptor! OK, we all know all there is to know about Star Wars, but, we also know that won't stop you from reading more and more about our favorite film of all time! Moviephone.com has an entire section dedicated to the Dark Lord of the Sith and the movies that surround him including character guides, tid-bits about the movies, games, photos, videos and even a way to get Premiere tickest! Check it out now! Whoops! Seems like we lost a post from yesterday...here is Mas Amedda in all his Senator-ness...at least until Palpatine decides he doesn't like non-humans I suppose! Check him out below or in the Revenge of the Sith Visual Guide...head over to Alliance Collectibles to order yours today! Check out the new Wookie Flyer over at Hasbro. The Flyer comes with a special Wookie Warrior pilot and helicoper blades that spin! The cool folks over at MouseDroid.com have tons of pics from the Austrailian Toy Fair including the 500th Vader and Battle packs...head on over and check them out! Alliance Collectibles has added some more great items at great prices just for visitors of the Jedi Temple Archives! Check out what's on tap for this week! These specials will last until April 17, or while supplies last, so don't delay...order you stuff now! Another update for the Revenge of the Sith Visual Guide brings the venerable Jedi Master Obi-Wan Kenobi. He comes with a lightsaber slashing attack and can swap hands so you can also set him in a standing pose with the lightsaber attached to his belt. Another battle in the Clone Wars must mean that the Seperatists still have plenty of Super Battle Droids laying around. This droid comeswith a firing arm blaster and can be seen below or in the Revenge of the Sith Visual Guide! Check out Alliance Collectibles to build your droid army! All these figures in the Visual Guides so far and no Vader yet? Well, he's in there now...your favorite bad guy is now in the Revenge of the Sith Visual Guide! The Dark Lord comes with his own lightsaber and lightsaber attack action! This version of poor helpless Supreme Chancellor Palpatine comes with a figure stand and the binders. Check him out in the Revenge of the Sith Visual Guide or by clicking below...head over to Alliance Collectibles to order yours today! The fine upstanding Republic Senator, Mon Mothma is the next to be added to the Revenge of the Sith Visual Guide. She comes ready to debate in the Senate with her baton, a head piece and a figures stand! Jedi...we all love the Jedi, so why not add another to the Revenge of the Sith Visual Guide in the likes of Council Member Shaak Ti! She comes with a figure stand, lightsaber with detachable hilt, and data pad and is ready to take on the evil in the galaxy! Shaak Ti and the rest of the Council members can all be found at Alliance Collectibles! The Revenge of the Sith Visual Guide adds a pair of Jedi Masters to the mix. Keep checking back as our massive ROTS guide update continues in anticipation of the movie's big release in just 42 days! More Deluxe Figures have been revealed by Hasbro! In this article you can read about the new Clone Trooper 3-pack, Stass Allie on her BARC Speeder, the Crab Droid and a new Spider Droid! Padm� Amidala is now in the Revenge of the Sith Visual Guide...we won't say any more than she comes with a base and blaster and decent articulation...the rest is all for those who want to be spoiled. Don't forget to get all of your spoiler filled figures at Alliance Collectibles! Now this is a cool figure...super-articulated, removeable helmet with a special helmet cover and 2 blasters...one that looks so close to a Biker Scout Blaster, the AT-TE gunner is a must have! Check him out in the ROTS Visual Guide and order your AT-TE Army from Alliance Collectibles! They're cool little ships with nice detail and how can you go wrong with a line that includes a Star Destroyer? Well...there will be more than 2 waves of the little bad boys this year as we discovered when we got the Titanium catalog inside the lastest wave...check out the catalog below and head on over to the ROTS Visual Guide to check out the list! So, you want to buy a few cases, but you don't want any doubles? Wizard has the solution for you...They have a case of Assortment 1 and anothe rof Assortment 2 made specially without any doubles! Click here for more information and to order. Thanks to "good 'ol Sanj" for the tip! We received 3 cases of Star Wars EP III Revenge of the Sith Action Figures Collection 2 Wave 1 & 3 Cases of the LOTR ROTK Pelennor Fields Gift Pack. We will be receiving many New Star Wars Episode III figures as well as Star Wars Mini Bust. LOTR figure Asst 5 are on there way along with Family Guy Series 2. We will update you shortly on all the new collectibles coming to Toyfellas.com like the new NECA and the Four Horsemen "Staction" 6" scaled cold cast resin figures Hordak, Clawful & Snout Spout, Marvel Superhero Showdown & McFarlane�s NBA Legends Series 1 and so much more! The ever knowing dudes over at BeJedi.com have the inside track on the new David Prowse autobiography called Straight from the Force�s Mouth and they have a samll review of the book and info on how to get yourself a copy...head over to BeJedi.com and check it out! Hasbro has more images up of the basic figure line...this time we see Commander Bacara, R2-D2 and Anakin Skywalker....be casreful, there are spoilers in this artile! More than 40 items have ben created for Celebration III and it only starts at the exclusive talking Darth Vader! Check out the entire list by downloading this .pdf file and read more about it at the Official Site! Know Your Star Wars Theatre! Seven weeks before its release, "Star Wars" fanatics started lining up outside Grauman's Chinese Theater for the sixth installment of the popular George Lucas movie series. The vigil began Saturday. But there's a problem: "Star Wars: Episode III -- Revenge of the Sith" won't be showing at the Hollywood landmark when the movie is released May 19. The studio, 20th Century Fox, opted instead to open the film a mile away at the ArcLight theater. Anakin Skywalker, Jedi Knight, and a Hero of the Republic makes yet another appearance at the #2 spot in the ROTS Visual Guide. His power has grown, and his lust for more power has grown with it. There is a possibility of a small spoiler here, so we take special care in making sure that those that want to be Spoiler Free, remain Spoiler Free. Make sure to stop by Alliance Collectibles for all your Sith needs. Here is a bit more information...and pictures of the Early Bird set and the figures we can expect! Read it all here at Hasbro!!! Chewbacca rejoins the Star Wars universe, or we just get introduced to him, depending on the order you view the films, and we've added him to the ROTS Visual Guide. The mighty Chewbacca comes complete with bowcaster and "Wookie Rage"...hey, you'd have it too if someone was trying to take over your planet!! Alliance Collectibles has Chewie and his Wookie friends in stock, so stop by and build that Wookie army! Jedi Master Kit Fisto has beenadded to the ROTS Visual Guide. Master Fisto comes with a base, his lightsaber withdetachable hilt and articulation at the shoulders, elbows, wrists, waist, legs and knees! Looking to build you Jedi High Council...head on over to Alliance Collectibles! The Polis Massan are a new race that we'll see in Revenge of the Sith, so with that, we'll call this a spoiler just for those ofyou who are 110% spoiler free...Check out what one looks like in the ROTS Visual Guide or by clicking below. Don't forget to head over to Alliance Collectibles to pick up all your ROTS needs! George Lucas will be making a very rare (and most welcome) public appearance this month atCelebration III! This will be the fist time that he will be at a fan convention since 1987 to celebrate the 10th birthday of A New Hope. The event will take place in the Sagamore Ballroom, but the day and time are still to be set...Read all the details at the Official Site. Anakin Skywalker and General Grievous round out this wave of Galactic Heroes from the Revenge of the Sith. Click the thumbnails below or visit Playskool Visual Guide tocheck them out! The Emperor and Yoda from the Galactic Heroes Revenge of the Sith wave have been added Playskool Visual Guide...take a closer look by clicking the images below. Today we'll be adding some of the cool new Galactic Heroes from the Revenge of the Sith wave...the first set of Anakin Skywalker and Count Dooku can be seen in the Playskool Visual Guide or by clicking below! OK...We still don't know if there will be a digital version of Revenge of the Sith but we have gotten questions on where it can be seen if it does appear on the digital screen...Thanks to Nick at the NJSWCC and The Jawa you can reference this page from DPL Cinema to see where there are theatres with digital projectors in your area...Thanks Nick! 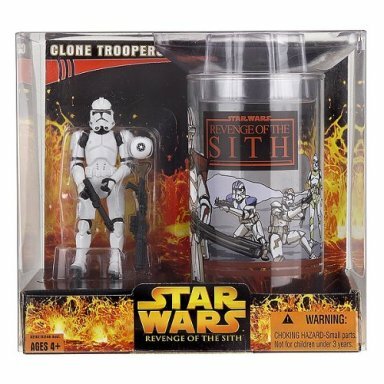 Entertainment Earth has just gotten in a number of cases of ROTS figures including Collection 1 - Wave 2, Collection 1 - Wave 2, Collection 2 - Wave 1 and the 12" Wave 2...all every evenly packed cases well worth picking up! A Galaxy of Stars writes in to remind everyone that the big event is April 16 and that there will be a line up of 30 Star Wars and Dr. Who guests in attendace with pens in hand...if you don't have your tickets for this cool even in Somerset, UK yet, now would be a good time to pick them up! We update the ROTS Visual Guide once again today with the addition of the most powerful Jedi in the Universe. Yoda graces the #26 spot in the new ROTS line and comes with a Spinning Attack action feature. Make sure to check out Alliance Collectibles for all your Sith needs! Another Hasbro updated brings up more images and descriptions of ROTS figures yet to come...click the images below to learn more about the super-articulated Clone Trooper, Neimoidian Warrior, Wookiee Warrior and Destroyer Droid! Didn't get the chance to pick them up on April 2nd? 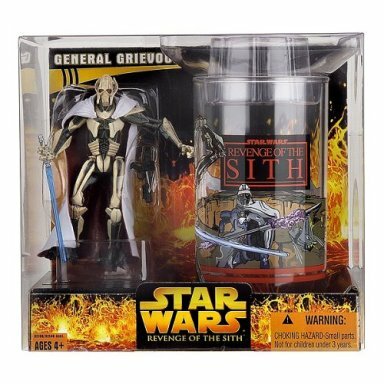 Well, the Obi-Wan, Genreal Grievous and Clone Trooper ROTS cups are up for sale at Target.com! Head on over and order yours before they sell out! And, while you are there take note that the Lava Reflection Darth Vader is up on the site too...it says it won't be for sale for another 4-8 weeks, but this is one worth keeping an eye on! And...they already have a bunch of stuff for sale including a few of the ROTS Lego sets (save $9 on the Turbo Tank!) and the ARC-170!! Take a look at the 2nd wave of Revenge of the Sith Galactic Heroes over at Hasbro's website! This round includes 2-packs or Kit Fisto & Mace Windu, R2-D2 & Super Battle Droid and Chewbacca & Clone Trooper! We continue our onslaught of Visual Guide Updates with another addition to the ROTS Visual Guide. Anakin Skywalker, the one time sweet innocent boy has been seduced by the Dark Side, and has some serious Sith Matters to attend to. In doing so he meets up with his one time Master, Mentor, and Brother, Obi Wan. Todays update is #28 in the ROTS line and captures Anakin's likeness during his duel with Obi Wan. Some spoilers may apply so take care in viewing. As always the fine people over at Alliance Collectibles have what you need in stock! Saesee Tiin has grown his horn back since his mishap during the Cone Wars and he's also been added to the ROTS Visual Guide. Saesee comes with his lightsaber anda stand stand and has articulation at the head, shoulders, elbows, wrists and knees! Don't forget to head over to Alliance Collectibles to pick up the stuff you got beat out on yesterday! As far as contests go, this one takes the cake! What do you need to do? Well, drum up your imagination and draw...it's that simple. Then, to top it all off, the drawings will be judged by the likes of Jan Duursema, Andy Hepworth, Iain Lowson and Thomas Hodges!! The prizes will be as great as the panel with Dave Prowse and Ray Park autographs, Sneak Preview Revenge of the Sith, Clone Wars Animated and OTC figures, an Unleashed X-wing Luke Skywalker and a Celebration 3 Darth Vader all up for grabs...so head on over to BeJedi, get out that drawing medium and May the Force be with You! We've put together a little on-line shopping guide for everyone to make your day go as smooth as possible tomorrow! Just click the links below and you'll be exactly where you need to be! Obi-Wan Kenobi is the latest addition to the ROTS Visual Guide. Obi comes with his lightsaber, a stand, "Jedi Kick" action and a pole to kick over! Alliance Collectibles has good old Obi-Wan...or is it Ben now...in stock and ready to ship out! StarWarsShop.com has the 500th Vader up and ready to order. Click on the images below to order yours! She's not Mace Windu but I doubt I'll hear anyone complain...Aayla Secura has been added to the ROTS Visual Guide. She comes with a lightsaber, a figure stand and articularion from her neck all the way down to the ball joints in her ankles!! Head on over to Alliance Collectibles right now and order all your ROTS stuff before they are sold out! OK, you have been out and about and you just got back with all your toys! Tell us how your experience went right here! Got pictures of all the fun that you'd like to share...send them in and we'll post them for all to see! We found three new Target cup and figure sets while shopping around at Target.com! The ROTS Obi-Wan, Clone Trooper and General Grievous won't be around for another 4-8 weeks, but they are way cool to takea look at right now! Brianstoys.com latest newsletter is full of good stuff starting with al the great new Revenge of the Sith stuff that they have for sale! Head on over and stock up on it all!! 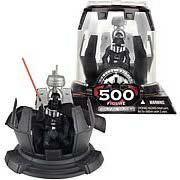 Entertainment Earth has the 500th Darth Vader up for pre-order along with the rest of the ROTS stuff that is ready to purchase today! Head on over and reserve your 500th Vader today! This is no April fools! Our massive updates for the Revenge of the Sith Visual Guide continues with the Wookie warrior named Tarfful. Be sure to check him out by clicking below. Keep checking back as we unleash more Sith items in the coming days and weeks! The biggest, baddest, coolest Jedi ever, Mace Windu now joins the ROTS Visual Guide. Complete with the ability to throw off any such annoyance as Sith Lightning, this is one Jedi that is a must have in the colleciton...don't forget to stop by Alliance Collectibles tomorrow to add him to your collection! The Trade Federation continues its attack on the Revenge of the Sith Visual Guide with the (not so) fearsome battledroid. Alliance Collectibles has a whole army of battledroids ready for you to command! Click on the thumbnail below to checkout the latest edition of the battledroid. Luminara Unduli is the latest to find her way to the ROTS Visual Guide. Luminara has ariulation at the waist, wrists, elbows, legs, neck, shoulders and knees and she comes with a base and lightsaber. The folks at Hasbro have posted thier Revenge of the Sith toy catalog...it features so much of what we have already seen and even a glimpse at some new things like the Wookie Helicopter and a Clone Trooper 3-pack. Download it right here. Senator Bail Organa now has his place in the ROTS Visual Guide. Leia's step-dad comes with a base and blaster and has ariulation at the waist, wrists, elbows, legs and you can do the 360 degree spin to his neck, shoulders and knees...check it out below! The Clone Trooper with Qucik-Draw action is now in the ROTS Visual Guide. All it takes is a squeeze of the legs his blaster comes to the ready...minor spoiler in this one, but that should not stop you form stocking up tomorrow at Alliance Collectibles! For all of you attending Celebration III with you Padawans there is good news...the Jedi Training Academy will be back! The little ones can learn to use a lightsaber, Jedi philosophy and more! Read up on it right here. Jedi Master Ki-Adi Mundi has now been added to the ROTS Visual Guide. Ki comes complete with a stand, lightsaber and artiulation at the elbows, wrists, waist, and ball joint head, shoulders and knees, not to mention a soft goods tunic and hood that fit just right! C-3PO is next on the update list! For the 1st time ever we'll get to see or favorite protocol droid all dressed up in 100% gold! Thi sversion of C-3PO features quite a bit of articulaion for him including at the shoulders an legs, but also a swivel at the hips and neck! Not bad at all! Click below or head on over to the ROTS Visual Guide to check him out...and don't foregt to bookmark Alliance Collectibles for your super shopping day tomorrow!! Build a Giant LEGO Diorama in Times Square! Do you live near New York City? Well, if you do, call in sick to work today (you'll need to do that to rest up for tomorrow anyway) and head on over to the Times Square Toys R Us and help take part in a 6 hour Star Wars LEGO building party! All are welome to help build the mural, all you need to do is bring a little imagination! Next up...Emperor Palpatine! Well, we won't say much here since there is spoiler material here, you know, just in case you've been 100% spoiler free...Check out figure #12 in the ROTS Visual Guide or by clicking on the thumbnail below. It can be easy for some of us to foget thatthere will be a whol ebunch of books about Revenge of the Sith for sale on April 2nd too...from the novel to the The Art of Star Wars: Revenge of the Sith and The Making of Star Wars: Revenge of the Sith and more. Read a short interview with Matt Stover right here! The masters behind the visual magic of Revenge of the Sith will be attending Star Wars Celebration III. John Knoll and Roger Guyett, both Visual Effects Supervisors at Industrial Light & Magic, and for Episode III, will share some of their secrets of production. Each will take time on stage to show some of their own images from behind the scenes, and to answer questions from the audience. Read the full story right here!